Either you were stupid when you entered, or stupid by the time you left. It didn't matter. You were still stupid. This article was originally more a review of the Plasticville Police Station than anything else. I only got the kit as part of an ebay lot, and was at a loss as to what I would do with it. It's not all that interesting a kit. 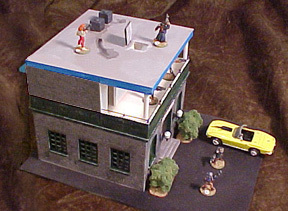 Except for the building front, it is identical to the Fire Station. The centre piece in the roof may be different, I don't know: My kit was not complete. Unlike the Fire House, there are no opening doors. It's just a square box with a removeable roof.. 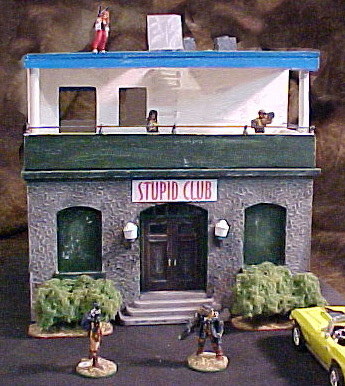 The only changes I made were to grind off the raised 'Plasticville Police Station' above the door, to add an interior floor level with the top of the stairs, and to add a sattelite dish on the roof. Then Doug told me what he was doing with the same kit, and I realized I was getting lazy. 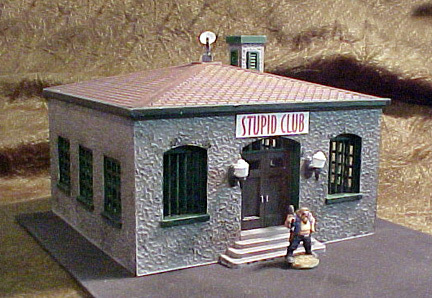 Stupid Club got some renovations. No way I was going to be outdone without a struggle! I cut off the chimney, and built up the roof-location lip in that area with plasticard. I also closed the front windows with card. Then I started to work. The pictures tell the story: I cut a new upper floor from Cintra, and walls for an upper storey. It's only half-size so that much of the upper floor is a balcony. The low wall surrounding the balcony is topped with a handrail made from wire & pearls. The pillars at the corners are cut from chopsticks. 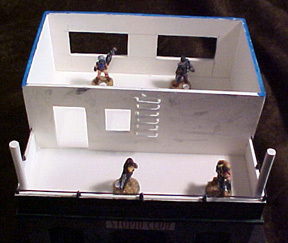 The roof has an opening access hatch, with ladder rungs set into the wall below it. The ladder rungs are wire 'staple' shapes, with pearl spacers. The locating pieces inside and the outside lip on the roof stiffen it (not that it really needs it) and there are a couple of wooden blocks representing A/C units to use as removal handles. 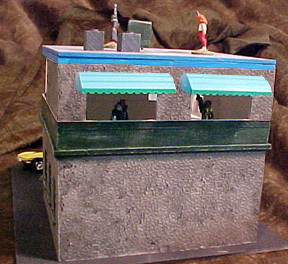 The awnings over the back windows are from dollar-store 'Candy House' kits. I trimmed the base of the chimney, and glued it to the roof, so I can use the building in its original form. A. Make eye-rings from wire. B. Slip small pearls or beads onto the shank. They assure that the rings sit at the same height. C. Thread the wire rail through the rings. D. (Top view) The rings should be at right angles to the railing. Where there's a corner, angle the ring and bend the wire. Once the rings are on the wire, glue them into position in holes drilled in the wall and close them with pliers.